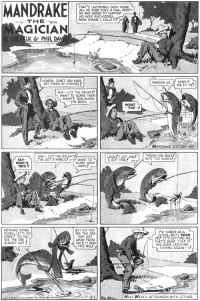 "The Fisherman" is the 1st Mandrake filler page in between the 10th and 11th Sunday story. The story was written by Lee Falk and drawn by Phil Davis. A lazybones won't do any work to support his wife and children, all he ever did was fish. Mandrake gestures and.. The fisherman and the fish switch roles. The terrified fisherman breaks his rod, and says that he will never fish again. This page was last edited on 17 November 2017, at 16:32.